An Arctic goose breeding in marshy parts of the tundra, this species feeds by digging up roots and bulbs, and also grazes on buds and leaves. It is sociable, even in the breeding season, when pairs nest only a short distance apart. 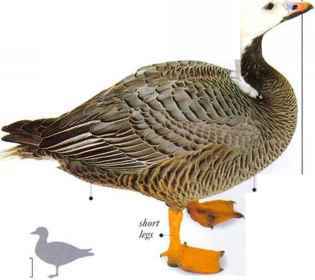 After breeding, the geese migrate-in flocks, sometimes several thousand strong, to winter on marshes and coastal grassland. The call is a harsh cackle. • NliST A natural hollow in the ground, lined with leaves and an inner down cup. • DISTRIBUTION Breeds in Arctic zone of North America. Winters as far south as Mexico. • REMARK There are two color phases (/>. 13): white, and "blue" (gray, tinged blue in parts).